seem obvious in the field may be obscure back in the office a couple weeks later. Sketches of your surveyed area will also aid in comprehension and ordering of the data. These sketches do not need to be to scale. Do not crowd your notes. that should be included in all field notebooks. Figure 2.1. 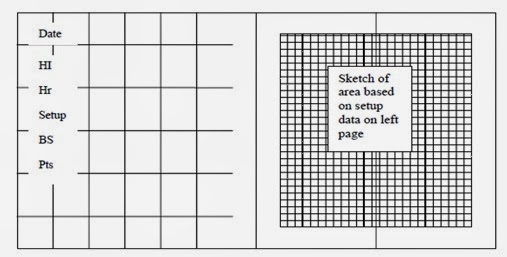 Diagram of data to include in field notebook. The distance between the points can be determined with a measuring tape. the survey rod. A total station is simply a computer. It can only know what you input. reference all ensuing point data to that. know where it is and where it is looking. instrument and the rest of your points will be referenced to this location and direction. a. Adjusting the two closest to you at the same time, turning them both inward will move the bubble to the left. Turning them both outwards will move the bubble to the right. b. Adjusting the knob away from you, turning it counter-clockwise will move the bubble away from you. Turning it clockwise will move it towards you. 8. 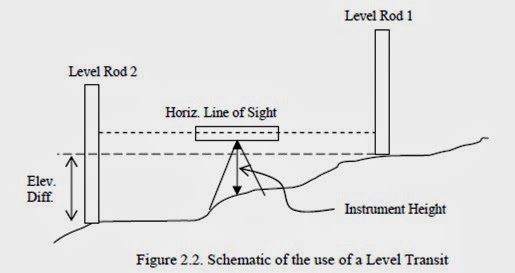 After instrument is level, check location of plumb. If you are within a couple of inches, you may move the instrument by half-unscrewing the bottom screw and sliding the instrument into place. If you are too far off, then you will have to move the whole tripod into position. 9. Repeat until the instrument is level and over the correct point. instrument. Running the instrument upside-down will invalidate your data. that you’ll need to double check. own layer in the program.